“Sugaray” Rayford is an American Soul blues singer and songwriter. 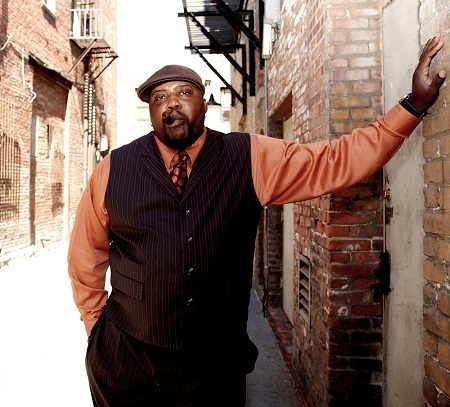 He has released Six albums to date and was nominated for two Blues Music Awards in 2019 – Soul Blues Male Artist and B.B. King Entertainer of the Year. Texas born Caron “Sugaray” Rayford began his musical career at the age of 7 singing & playing drums in church, and his gospel influence can be heard and felt in his music. Rayford’s phrasing is intimate and conversational and the soulful gravel in his voice hints at his firsthand experience with hardship. Beginning about 15 years ago in the San Diego area, he sang lead vocals with a R&B/Funk band called Urban Gypsys. With this band he had the privilege of sharing the stage with many notable artists such as The Average White Band, Dennis Quaid, Joe Luis Walker, Kal David, Super Diamond & Venice, to name a few. After some soul searching he left the Urban Gypsys and became lead vocalist for Aunt Kizzy’z Boyz, a Temecula area blues band. Aunt Kizzy’z Boyz represented San Diego (Blues Lovers United San Diego) in Memphis Tennessee January 26th- 28th, 2006 at the International Blues Challenge (IBC), and brought home the 2nd place prize. The band began playing higher profile gigs and in 2007 released their 2nd CD “It’s Tight Like That”. In September 2008, the Boyz won the LAMN Jam Grand Slam Urban Artist of the Year title by a landslide; they beat out hundreds of competitors. Sugaray formed his own band in 2010, and it includes keyboards, trumpet, and sax.